Shoulder rehab exercises to improve range of motion are very important with any shoulder rehab program. Most shoulder injuries involve some type of range of motion loss, and depending on the injury, this may be mild to severe. There are many different factors that can cause range of motion loss in the shoulder. The exercises below are a few that I use with my patients to help improve their range of motion. They are not all inclusive, but are a good start to working towards regaining normal shoulder function. Using a T-bar or stick is a great way to improve shoulder range of motion without overstressing the muscles of the shoulder. These types of shoulder rehab exercises are considered Active Assisted Range of Motion exercises, or AAROM. AAROM exercises help to improve motion in the shoulder by helping the shoulder muscles move through a range of motion. They are not as difficult as active motion exercises because the muscles do not have do all of the work alone. AAROM exercises are also a good way to start to improve strength, providing a submaximal contraction. Most shoulder rehab programs, especially after surgery, will start with AAROM exercises and then progress to active motions as the shoulder muscles get stronger. Shoulder flexion is the motion of bringing your arm out in front of you and lifting overhead. You can use a T-bar, or any long stick, for this exercise. 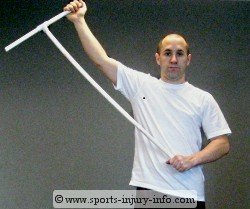 Start off gripping the end of the stick or T-bar with the hand on your injured side, and also with your un-injured side. Using your un-injured arm, push your affected arm up in front of your body. You should be doing most of the work with your un-injured arm. Go as high as you can until you feel your shoulder start to get tight. You may have some discomfort, but should not have severe pain. Once you get as high as you can, let the tissues stretch for a few seconds, then lower your arm back down and repeat. Shoulder abduction is the motion of bringing your arm out to the side and lifting overhead. You can use a T-bar, or any long stick, for this exercise. Start off gripping the end of the stick or T-bar with the hand on your injured side, and also with your un-injured side at the other end of the stick. Using your un-injured arm, push your affected arm up and out to your side of your body. You should be doing most of the work with your un-injured arm. External rotation is performed when you rotate your shoulder away from your body. In this picture, with the arm at your side and your elbow bent, it is moving your hand away from your body. You can use the T-bar or stick to perform this motion much like the others. 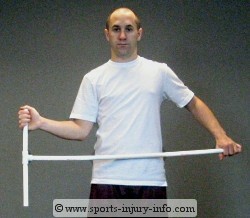 Grip the stick with your injured side hand, and also with your un-injured side hand at the other end. use your un-injured arm to rotate your shoulder away from your body. Go as far as you can until you feel tightness, let the tissues stretch for a few seconds, and then return to the starting position. Depending on your injury, you may have significant loss of motion, or you may only have a little. AAROM shoulder rehab exercises can be performed daily, and may even be done several times a day. Make sure that you are following any restictions that your physician or athletic trainer have given you as far as how much motion you should be doing. I have my patients perform these exercises 2-3 times a day at home, doing 20 repetitions in each direction. Shoulder rehab exercises that help improve range of motion are essential to any good shoulder rehab program. Shoulder flexion, abduction, and external rotation can all be improved with T-bar or stick AAROM exercises. You can perform these daily. 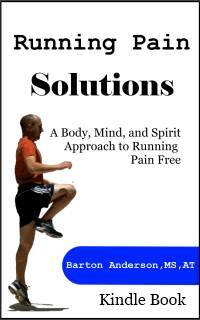 Remember to only go as far as you can without severe pain.